I am echoing the president’s view, he’s not been bashful about that view. He would also like the fed to cease shrinking its balance sheet and I concur with that view looking at some, the economy looks fundamentally quite healthy. We just don’t want that threat there is no inflation out there, so I think the fed’s actions were probably overdone. There’s no emergency. It’s just a point of view, okay. I mean, I watch yield curves I have for a long time, tens to bills are actually negative slightly inverted commodity prices, commodity index took a big whack in the fourth quarter and earlier this year. This is not an emergency this is not anything, this is just our point of view frankly, I think they went too far…we don’t want to threaten this great recovery basically, the president has, in effect, redesigned and redeveloped and reengineered this economy with lower tax rates, and a big rollback in regulations, and opening the door to energy again and also, trade deals that I think will be very pro-growth. We don’t want to jeopardize that we’ve got more people working than ever. We’ve got remarkably low unemployment across the board, including Kelly, I might say, the biggest contributor to the labor force last year was women. And all the minority categories this is a terrific story. I don’t think that the rest of the world can overwhelm the U.S. In fact, usually, my view is, continues to be, we are the driver, we are the engine. Okay? If we’re doing well that’s going to help the rest of the world, right but I will say, no question, when you look at Europe, particularly, big trading partners and Canada, and parts of Latin America, and Asia and China, we are, you know, wary of that. We’re concerned about that so I see this more as actions to protect the great economic re-emergence that we have. Growth solves a lot of problems. Growth solves employment problems. Growth solves corporate/business problems. Growth solves budget deficit and debt problems. Growth is absolutely essential if you listen to the president talk, he says this all the time. Growth, growth, growth and I’m delighted he has that point of view. Kelly evans: how unhappy is the president with Chair Powell at this rate? Larry Kudlow: look. He’s had his views on Chair Powell. They had dinner together. I couldn’t make the dinner. He’s our chairman. We’re not going to displace him things of that sort. I don’t want to get into any of the personality. Kelly Evans: is he unhappy with the treasury secretary as a result of this? 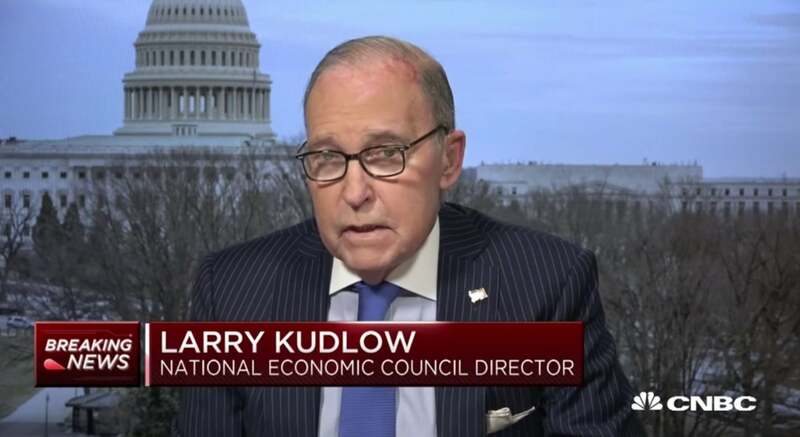 Larry Kudlow: Steve Mnuchin has been a terrific treasury secretary. One of the president’s closest advisers and friends, so the answer to that, I believe, no. The big surprise, I guess to many people, not so much myself, but this is supply side tax cut and the supply side economy. You’re producing more investment, more capital formation, more goods and more jobs that is not inflationary so therefore, you have to kind of recalibrate your thinking about interest rates but it is up to the fed. I am not here to criticize the fed. I’m just saying this is our point of view. The post Larry Kudlow On Why The Fed Should Cut Rates [Full CNBC Transcript] appeared first on ValueWalk. This entry was posted on Friday, March 29th, 2019 at 5:46 pm and is filed under Immediately available to public, ValueWalk. You can leave a response, or trackback from your own site.